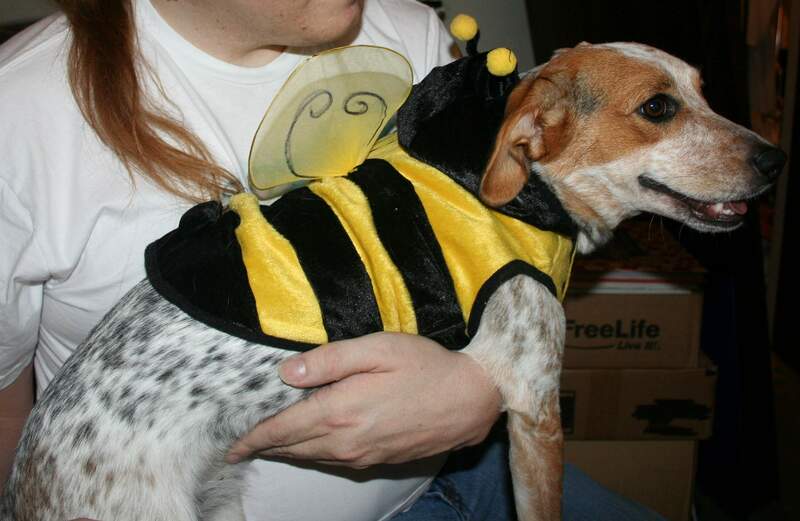 Things you did not expect: A dog, in a bee costume. Maddie is so dang cute!! Reminds of that Blind Melon song. Or the Pearl Jam song “Bee Girl.” Dig the linked videos. Maddie has a longer neck than the costume, so the hood doesn’t quite fit right, but it’s adorable, eh! Related issue: Maddie likes to tear up toys. We basically expect any toy we get her will have the stuffings pulled out of it in a minute or two after giving it to her. Stuff-n-fluff! Everywhere!! We have to make sure she doesn’t get any random poofy things around the house, or it’s the end. So like, hey, if anyone knows any good really seriously indestructible dog toys, let us know. Seriously. But they have to be genuinely indestructible in a very serious way. And squeeky, would be nice too. She likes a nice squeaky toy.